The flowers in bloom have changed with the wind, and pleasant season is upon us. 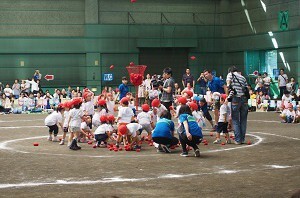 I hope a lot of families could see their children try their very best at Physical Festival recently! Positivity, dedication, and vitality, basically the desire to do things, seems to be a trait that people are born with regarding their future. In their developing years, the thing that satisfies children most is actually “pleasure”. If they try hard, mommy and daddy will be happy. So they try their best. Effort and pleasure begin to merge, getting stronger, and forming the “shape of their heart”. I think this past Physical Festival was a big chance to develop, by trying their best, and being congratulated for it. With the fever of Physical Festival out of the way, October is a month of exercise, reading, and appetites. We set aside this time at the kindergarten for the appreciation of art, increasing the time for drawing, sculpting, and creating! Have many of you had a child hold up a picture, calling out “Look at this!” These pictures give a glimpse into the feelings that child is having at the time they draw it. Showing these pictures to people they like helps children enjoy both drawing and communicating! Kids learn to use their forelimbs as hands around a year old, and can draw things. In this period, they just learn to enjoy putting something on the paper. As they go from lines, to curves, to circles around two and a half, they can begin naming things, like “mommy”, “cat”, and so on. By three they can draw simple people, and at five they can even make horizons. This is how children develop when drawing. So when an adult offers advice like “There aren’t any arms! Take a look.”, it actually negatively impacts a child’s chance to grow. Without any chances to do art at home, they lose chances to develop their expression. It is important to let them grow at their own pace, and make discoveries on their own. This allows them to enjoy the experience fully. It is important to keep an environment where the children can do art, voice their feelings, and feel happy about the things that they make.